Keeping track of an extensive video collection can be quite a daunting task especially if the collection includes more than a few dozens videos, TV shows and movies; It becomes almost impossible if the number of videos crosses the hundred or thousand mark. That's were video collection programs like Movienizer come into play. Movienizer started out as a free software program but the current version of the program is not free anymore. You may download a free trial version from the developer website though to test it before you make a purchase. 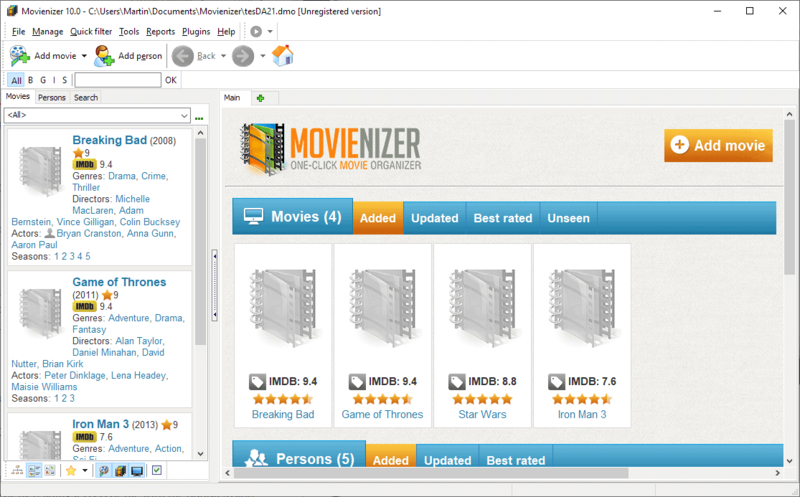 Movienizer is a software program that you may use to manage video collections. The program is format agnostic: it works with videos on storage devices like PC hard drives, gaming systems like the Xbox 360 or Sony Playstation 3 but also movies on DVDs, CDs, Blu-Rays or even Laserdiscs, or VHS or Betamax tapes. Movies and TV shows are organized into movie databases in the application and you may create multiple databases if you want. Movies can be added by title, bar code or by reading a DVD or file with the option to add multiple movies at once to speed up the process. Movienizer queries movie databases, IMDB specifically, on the Internet to retrieve information and to add information about each movie that it identified automatically. The process is very comfortable if it works but includes options to edit the data manually at any time. Note: You may change what gets downloaded when you add new movies or shows to the app. Some information, studios, technical information, gross earnings, or a large description, are not downloaded by default. Select Add Movie at the top. Type titles, read barcodes, select DVD or Blu-Ray folders, or select files or folders that contain video files. Movienizer connects to IMDB to look up information. It displays matching titles to you and you may select one to retrieve data from IMDB about it, and repeats the process for each title. Information that is downloaded includes a cover shot, actors, production details, a plot description, IMDB's rating of the movie, screen captures, posters, links to movie trailers, awards, and useful connection information that detail follows, followed, references, and spoofs. All information is editable. Just select "edit info" to edit, add, or remove information from the record. You may also add personal information such as your personal rating, whether the movie is in your collection, if you have seen it, want to see it, or want to sell it. The application displays all movies in a sidebar, and the selected movie on the right. You may change the sidebar information to people or search results. There is also an option to display movies starting with a certain character only to limit the display. The tree view display offers additional sort options, e.g. by writers, ratings, genres, or year. There is also the option to add biographies either manually or by downloading the information from the Internet. Movienizer supports a couple of extra features. You may use it to generate reports and to create movie catalogs for certain applications or services such as Google TV. Other options include extracting cover images from files, using plugins like the handy file name checker, or the option to transfer data from other catalog applications. Movienizer offers a great way to organize a video collection. Especially the option to download all the information from the Internet makes it comfortable to use. Why Womble, link is in the article? By the way i like that the have video tutorials. Ups sorry, Paulus you are right. Link updated. Sorry Womble. Nice find! good idea to take a look at the video tutorials, I didn’t find the interface very intuitive. Think this might take a permanent position on my hard drive. Does anyone know of a portable version of this or similar? One I can store on a thumb drive and lend to friends. Thanks. What can i use to database Music-Videos not Movies in similar way with auto screenshots and such? this software is awful bad nasty.i don’t like…………………………………..it doesn’t manage the filmes stored in my pc……………………..
> Does anyone know of a portable version of this or similar? One I can store on a thumb drive and lend to friends. Thanks.